Nicholas Evans was born in Aberdare in southwest Wales in 1907. At school his teacher recognized his talent for drawing and gave him a pencil, but he soon gave up as his parents could not afford to buy him paper to draw on. He went down to work in the mining pit aged 13. When he was only 16, his father died an awful death in a mining accident. He was only 43. As Nicholas continued working down the pit, he was impacted by the testimony of the man he worked with who was known by his work mates as Dai Pentecostal. Dai would often sing hymns while working, wielding his mandrel and cutting coal to the rhythm of the tunes. Nicholas himself learned the songs and sang them as well. Dai's influence on him was deep, helping him to come to faith not long after his father's death. Later in life he became a Pentecostal lay-preacher and would throughout the rest of his life preach at meetings around the area. Two uncles and other neighbours died in accidents and his mother persuaded him that he must leave the mines for good which he did when he was 19. He worked on the railways where he became an engine driver. His best-known painting is an early work full of drama entitled Entombed – Jesus in the Midst. There’s been a disaster – a group of miners is huddled, sharing fear and hopelessness after being entombed underground by a roof fall, with no way of escape. They are trapped in the darkness and their lights, forming a useless central pile in the foreground, have gone out. The rats are a sinister presence in the left foreground. Suddenly Jesus appears. He’s dressed as a miner. This carefully structured painting with the miner’s lamp at the apex serves to highlight the powerful figure of Christ. He stands calm, strong and serene, full of both mercy and hope. The impact of Christ’s presence means that the miners are transitioning from fear, hopelessness and despair to worship and adoration. The miner on the left is already in that posture of worship. The whole structure of the painting is reminiscent of medieval paintings where Jesus is either on the cross, rising from the tomb or ascending to heaven and a cluster of people are in worship in the lower part of the painting. Christ carries in his huge hands a lighted lamp whose rays pierce the darkness – perhaps Evans had in mind Holman Hunt’s Light of the World here. But Christ also holds out above their heads a bunch of golden keys, jangling them to awaken them out of despair and encourage them to rise up and follow him out of darkness into the light. There is possibly a biblical reference here to the angel awakening Peter in the dungeon in Acts 12. This is most surely a work that is worthy of meditation, speaking powerfully about the legacy of mining, the human condition and Christian hope. 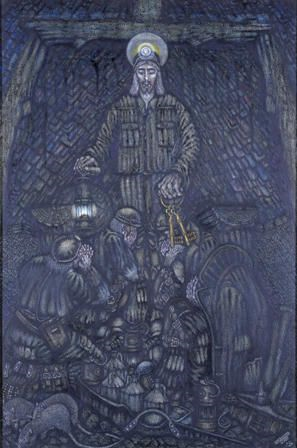 Nicholas Evans: Entombed – Jesus in the Midst, 1974, oil on canvas. 137.2 x 91.0 cm.